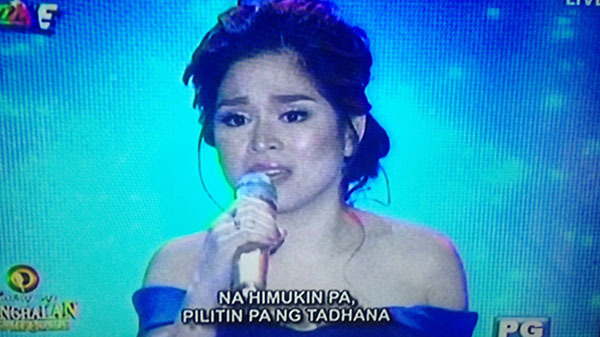 Jennie Gabriel sings ‘Natutulog Ba Ang Diyos’ on It’s Showtime’s Tawag Ng Tanghalan Q3 Semifinals Round 6 on Saturday, October 8, 2016. “Your performance was good. You voice was solid. With that performance, you will be the one getting impersonated,” said Karla Estrada. The semifinalists performs their song choice for Round 6. The five contenders compete for the last time in the Round 6 of TNT Q3 Semifinals on Saturday. The winner will be announced at the end of the show. What can you say about Jennie Gabriel’s version of the song? Share your comments and views on the discussion box below.